Until the 22 February 2016 Iranian Mines & Mining Industries Development & Renovation (IMIDRO) are taking bids for investment in the zinc-lead project Mehdiabad. Investment is needed for the construction of the mining refinery for at least 800.000 tons of zinc concentrate and a by-product of 80.000 tons of 60% lead-silver concentrate a year and the infrastructure needed for the project. In 2005 the previous co-owner Union Resources Ltd valued the investment needed at 1.6$ billion. Allowing for inflation and the current conditions they can be priced at around 2$ billion. The Iranian state owns a 62% stake in the project. The current situation with Mehidiabad, it seems, is a colourful illustration of a conflict between the market tendencies and the rules of the game. Whether mining industry of Iran can succeed in attracting investment will depend on any changes and developments of those rules. Judging by the headlines on the IMIDRO site, the primary aim of the deputy minister Mehdi Karbasian is offering cooperation to as many countries as possible. Belarus, France, Italy – are just a few of the countries he recently visited. However, so far no firm agreements have been reached. What is on offer? Let’s take the memorandum of understanding signed by the Geological Survey of Iran and their French counterparts in the Bureau de Recherches Géologiques et Minières. In theory the departments are meant to exchange experience in exploration and development in mineral mining and the processing of rare earth elements, however realistically the French bureau only supplies information to French companies. The Geological Survey of Iran is preparing a 6$ billion mining investment package to offer to foreign investors when the president Hassan Rouhani visits Italy and France in February. Besides that, another investment package priced at 4$ billion is getting prepared for the Chinese Presidential visit. Mr Karbasian also promised to present the results of the exploration projects that were started two years ago. The results will be known in the next 2-3 years. From the near completion projects, we can point out Nikuyeh Gold Mine. «Nikuyeh is one of the new gold mines in Iran and results of its call for investment will be announced soon» –states the IMIDRO newsletter. It’s estimated that already proven and potential gold deposits in Zarshuran can reach up to 150 tons of gold. «If we consider Zarshouran as a mine, there are still 6 other zones where exploration projects may lead to more than 150 tons reserves», – stated the exploration manager of IMIDRO Ali Asgharzadeh. In total Iran is planning on attracting $200 billion of foreign investment which is needed to provide the 8% growth of the country’s economy. «We hope that lifting the sanctions will lead to better business market» Mehdi Karbasian states. Mr Karbasian hasn’t specified within what time frames Iran is expecting to attract such vast investment sum. It can certainly take years. According to indexmundi.com (who use the data from the IMF, UNCTAD and the official national sources), starting from 1970 Iran never secured more than $5 billion of direct foreign investments per year. According to the World Bank, in last 10 years (since 2006, when the first sanctions were imposed) the investment peak fell on 2012, when it reached 4.66 billion. Curiously, even if the sanctions imposed on Iran have any influence on the influx of direct foreign investment (FDI) at all, it must be rather insignificant. The statement “FDI volume in 2007 decreased comparing to 2005 (2006 and 2007 saw two UN resolutions against Iran) by 70%” sounds rather dramatic, but in fact the drop was just over $800 million. From 2008 to 2012 (when two more UN resolutions came through, joined by Europe, Canada, Australia, Japan and South Korea), on the contrary, the FDI volume increased more than twofold (from $1.98 billion to $4.66). By contrast, starting from 2013 when staunchly opposed to the American politics Mahmoud Ahmadinejad was replaced by the more careful and moderate Hassan Rouhani, the FDI volume went down to $2.1 billion in 2014. Significantly, the list of the most active investors doesn’t include China, which unlike European and American public companies could get away with ignoring the sanctions. Even in the first half of 2000’s, before the sanctions, only a few largest mining companies were exploring their opportunities in Iran. Canadian Lundin Mining in 2005 purchased 19.9% shares in Union Resources Ltd, which in term owned 38% of Mehdiabad. Co-owners of the project, according to the annual Lundin Mining report for 2005, were the Australian Century and the American Red Dog. Judging by the fact that the Iranian government is looking for new investors for this project it is safe to assume that the partnership with the Canadians didn’t work out. BHP Billiton tried building a gas pipe in 2002-2005, but became the target of accusations and pressure from the US government. Rio Tinto were exploring the Sari Gunay deposit, but in 2011 decided to exit and sold its share to the Zar Kuh Mining Company (mining operator), co-owners of which were the Mukashev family in Kazakhstan. Mehdiabad is well known and is of considerable interest for the big companies (for instance, Glencore were looking into it), the question is if anyone is ready to invest in the mining industry of Iran right now. Judging by the information coming from some official sources, European investors are interested. This interest, however, for now seems to be just talked about: «Poland’s KGHM, Europe’s No.2 and world’s No. 7 copper producer, has expressed interest in investing in Iran copper mines», – is noted on the National Iranian Copper Industry (NICICO) site. «We welcome the Polish government and the KGHM investment in Khatoon Abad underground mines. The NICICO is ready to accept investment also in flotation plants and projects for production of copper concentrate using hydrometallurgy method» stated the NICICO CEO Ahmad Morad Alizadeh at a Tehran meeting. Currently NICICO produces 250 thousand tons, but is aiming to increase production to 300 thousand tons in 2016 and 400 thousand tons in 2017-2018. According to the IMIDRO press service, an Italian mining equipment supplier Danieli and an Iranian organisation are establishing a joint enterprise Persian Metallic. It looks like that the sides will invest 60% and 40% of 2 billion Euros, which they agreed on during their last meeting this January. The enterprise is aimed at expanding the entire production chain of the Iranian steel industry. This target remains, despite the fact that, according to the World Steel Association, 12 out of 13 largest steel-producing countries (except India) lowered their output in 2015. Output of steel in Iran itself last year was 16.11 million tons (16.33 million tons in 2014). Production of the iron ore concentrate was 19 million tons (+1% since 2014), however eight biggest producers lowered pellet production by 30% from 7.9 million tons to 5.57 million. During the visit to Tehran the Kazakhstan delegation discussed possibilities of cooperation in mining and metallurgical industry. Management of the national holding Baiterek stated that “We also looked into possibilities of investment in the mining industry of Kazakhstan. Iranian companies expressed interest and want to see Baiterek and its subsidiaries as partners.” The irony is that Kazakhstan delegation in fact talked about attracting investment with the people who are in direct competition – they are looking for foreing investment in their own country’s mining industry. The question whether Kazakhstan and Iran can agree on mutually beneficial cooperation remains open. Among the positive qualities of Iranian projects, market participants note well developed infrastructure, mild climate, cheap fuel, educated population, and most importantly – many big and interesting mining projects with a high possibility of discovering new deposits. 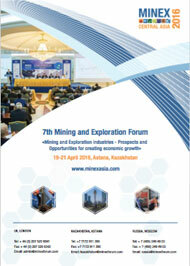 However, in the current climate perspectives for the development of mining deposits in Iran are low. Among the main reasons for the scepticism – high possibility of worsening international relations or even war, bureaucracy, red tape, unreliable information, but most importantly – the hardship many international companies are facing in their own markets: redundancies, low margins due to low metal prices, high competition, price war and the investors’ lack of trust in the big mining projects.